I think this delicious and versatile topping made of firm and slightly tart Prima apples stewed in a perfect mixture of mellowly sweet coconut sugar, coconut milk, and five-spice powder, reflects my current state of mind, i.e. confused in a good way. Geographically, I am now back in the heart of the Midwestern United States after a long vacation in Bangkok. Physically, my body clock is completely re-calibrated and in sync with the Central Standard Time. Mentally, I’m ready and excited to welcome the next chapter of my life — whatever that may entail. Emotionally, though, I’m still straddling two worlds. I miss my grandpa’s warm embrace and my cousins’ giggles. I miss friends’ daily text messages asking where they could take me to dinner that night. Doggone it, I even miss the jing-joks. Also, is it me or does time pass more slowly in the western hemisphere? I blame the autumn. It turns me into a melancholic rambler. 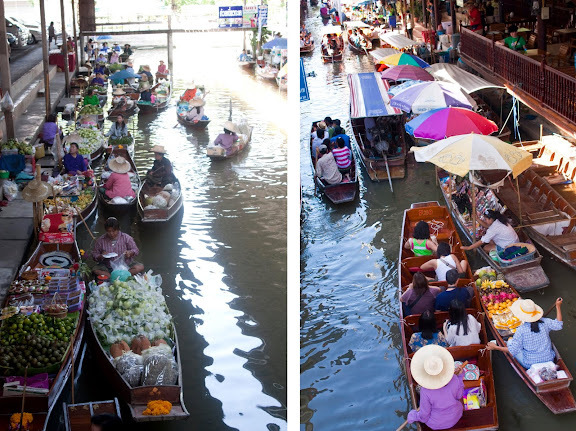 With the memories of Damnoen Saduak Floating Market, Thailand, still fresh on my mind, my annual visit to an apple orchard this year, less than a week after I’d arrived back in Chicago, felt somewhat … strange. Can you blame me? We’re talking about going from paddle boats to John Deere tractors here. I can’t say which of the two places/activities I like better, though. Both hold a special place in my heart. Every fall, I go apple-picking. You see, I spent more than half of my life eating imported apples — old, mealy, and heavily waxed — flown across the globe to Bangkok; I would be an idiot if I don’t take advantage of the availability of a wide variety of apples here in the United States. 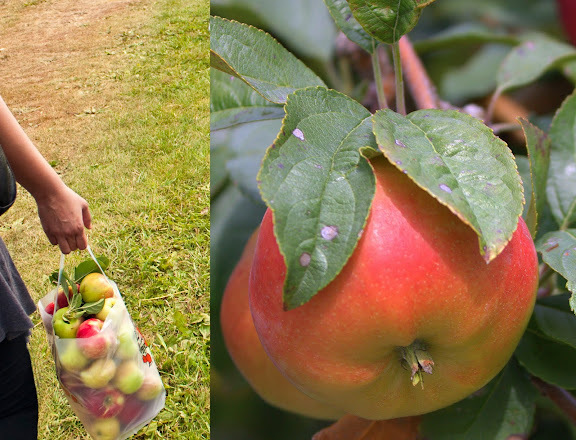 Have you eaten apples that have been freshly picked off the trees? There’s nothing like it. 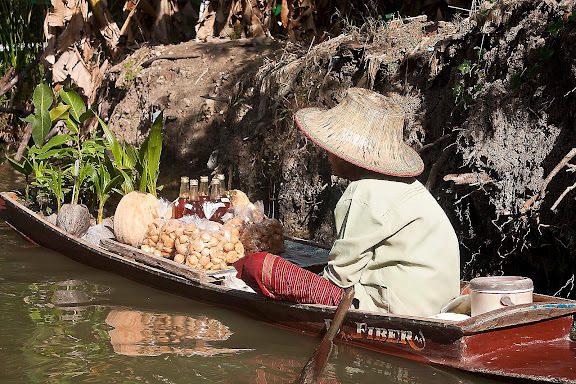 Likewise, every time I’m in Thailand, I always visit one of the floating markets for nostalgic foods which are becoming harder and harder to find in supermarkets. This one in Ratchaburi is more special than others mainly because this is where you can find delicious coconut nectar juice and coconut sugar. See bags of coconut sugar in the picture below? The lady on the boat perhaps had no clue some of her homemade coconut sugar, freshly made out of coconuts from her coconut grove, would make it all the way across the ocean to Chicago. In a desperate attempt to merge the two worlds, I came up with this versatile caramelized apple concoction which can be used as a topping for pancakes or yogurt, a mix-in for a plain muffin batter to create apple spice muffins which would be perfect for the fall, or a baked-in topping for used a bread filling. So many possibilities. Melt the sugar along with the butter in a heavy-bottomed pan over low heat. Once the mixture melts and starts to brown, add the salt and coconut milk. Stir in the cubed apples and the spices. Increase the heat to medium and continue to cook the apples until they become soft but still retain their shape. Take the pan off the heat and let the mixture cool. Use as a cake or ice cream topping. Keep the caramelized apples in an airtight container in the refrigerator for up to one week. Thank you, looks superb! 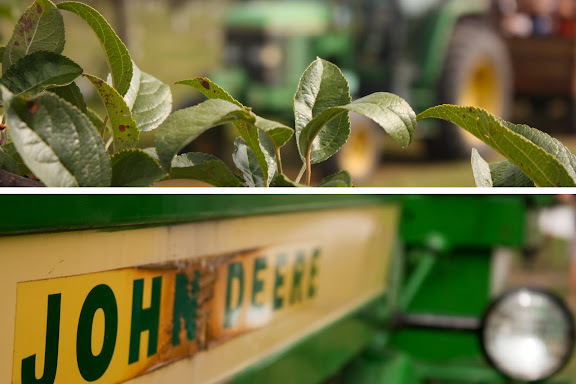 My son and I are going apple picking this weekend and for him, and I can assure you that John Deere tractors beat floating markets any time! In your opinion, is there any remote possbility that coconut sugar would be available in a Canadian Chinatown? Apples and cinnamon are best friends! And look at all these photos! You’re so professional Leela! I’m loving this combination of coconut flavors, apples, and five-spice powder! Fabulous! Funny you post this. I recently made an apple cinnamon loaf. haha… the apple mood is in the air. I love the photos of the merchant boats!! Tractors aren’t as much fun as paddle boats, but fresh apples is pretty good consolation. Spiced apple pancakes sounds wonderful, and it’s a lovely mix of your East/West ingredients. 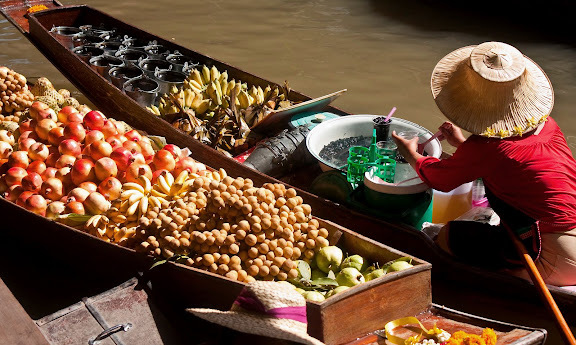 Nice post…the apples look delicious, love the idea of adding spices in it 🙂 Love the pictures of the floating market, lots of fun! Thank you, thank you, thank you for this! Looks like a great dessert treat just like that. Or would it be bad to drop a bit of vanilla ice cream on top? I go apple picking every fall as well, believe it or not, in California. I doubt I can find any coconut sugar, so I’ll have to see about tracking down some palm sugar. Great looking recipe and photos. Oh yes, sign me up please 🙂 We have apples in abundance and mango trees here- jealous? Ha ha 🙂 Love the market pics! Sounds like you had an incredible trip and I can appreciate the struggle as you transition back to the States. I just visited an apple pumpkin farm with my niece on a brief visit in the East Coast, and can vouch that there is no comparison to freshly picked apples. This recipe sounds delicious and I cannot wait to try. I’m unpacking from my trip to Ireland so it may be a few days. Nice post! The apples look delicious!